SIMAGE: Ruins exist between nature and the built world and yet, they can remain monumental and conjure enchantment, mystery, melancholy and other emotions often associated with creative works such as architecture, paintings, poetry or music. Images, like all things turn to ruins, but ruins are also images. 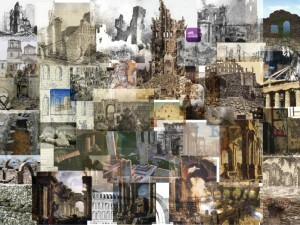 And images of ruins recalls the ruin of image, the degradation and fading of all things. Who doesn’t see that mixed in the beauty of ruins lays the fascination and ghost of past glories? The image of a ruin is made by time and nature. It is an image of time. Marcel Proust: Time, which changes people, does not alter the image we have retained of them. Antoine de Saint-Exupery: A rock pile ceases to be a rock pile the moment a single man contemplates it, bearing within him the image of a cathedral. SIMAGE: A ruin has two values. It has an objective value as an assemblage of brick and stone, and it has a subjective value as an inspiration to artists. Alfred Jarry: You won’t have destroyed everything until you have destroyed the ruins. SIMAGE: Is history a form of ruin? After all even the body will turn into ruin, so could history turn to ruins? Bruce Sterling: What we’re seeing is a new method of inquiry which is rising on the disrupted ruins of older methods of inquiry.